Addictions: Monster. | Pulp and Circumstance, Juiced. Consider humble blogger’s mind bloooowwwwnnnn. I mean, I’ve always loved Kanye West’s work; his ego, his style, his swagger, and he really gives you something major live. 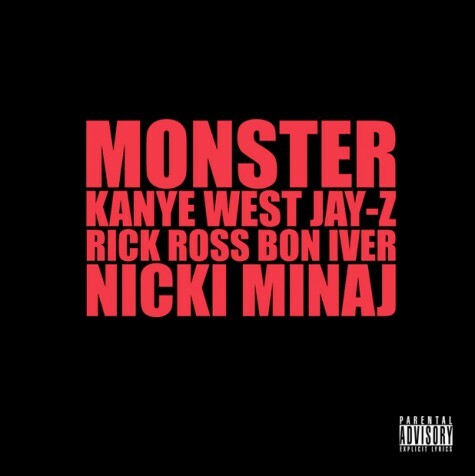 But when Kanye West recruits the likes of Bon Iver and Nicki Minaj…epic, gold, mind blown. Usually anything Nicki Minaj–in my humble opinion–touches is brilliant. She’s just got this something indescribable; this edge, this unpredictable spit, a roughness. And pair her with Bon Iver? The entire track is aggressive and the hook, well, it’ll hook you. Wait for Minaj to bring it. And bring it she does. Note: Kanye West has promised its all about the fans, and will release a new track every Friday through Christmas. The entire extravaganza is dubbed G.O.O.D. Friday, and good it is. Thank you K.West. Thank you. This entry was posted in Addictions, jwolf and tagged bon iver, kanye west, nicki minaj, rick ross. Bookmark the permalink. ← Delicious Drip: White Moon.